Religious belief has been allied, for centuries, with fundamentalism and intolerance. It’s possible to have one without the other, but it requires a degree of self-criticism that is not easily acquired. The logic of intolerance has been remarkably consistent over many centuries, within different churches and cultures. It can be used equally by those who read the Hebrew Bible, the New Testament, or the Koran. St Thomas argued, in the thirteenth century, that the harm caused by heresy (the eternal punishment of apostates) was much greater than the harm inflicted on heretics (torture and the mere loss of life); therefore, the latter was preferable to the former. The common feature throughout this blight on humanity is the uncritical conviction that supports both what is believed—the sheer variety of which alone undermines its alleged certainty—and the political theory that justifies its enforcement on others. John Locke helped liberate readers from the constraints of a political theory based on the Bible. He argued, in A Letter concerning Toleration (1689), that civil powers have no competence or jurisdiction to decide disputed religious questions, and that they should avoid either enforcing or restraining the religious beliefs of citizens. Locke also contributed to a critical assessment of the certainty with which religious doctrines are held. Believers first believe that their preferred scriptures were divinely inspired, and then believe what they appear to teach (which is disputed even by those who accept their alledged origins). One belief rests on another. Despite these historic developments, the default setting of many believers’ self-criticism remains stuck at zero. They believe, like children, that God chose them as a special people—as Cromwell claimed during the English civil war—or that he (or she?) allocated a geographical region to them as their earthly home. Many assume, as Aquinas did, that an uncompromising implementation of their religious convictions is rewarded by eternal bliss. It’s easy to see why fundamentalism fits so well with religious belief. If one begins to question a literal or naïve reading of one’s preferred scriptures, one slides quickly into seeing that none of us has a direct line to God. We are merely human, and must rely exlusively on fallible reason. God did not choose us or condemn others, and they are not our enemies. In many western democracies today, the defensive strategies of churches—to protect their members from ‘contamination’ by non-members—are limited to demands for separate schools, in which they can indoctrinate those who had been made members involuntarily soon after their birth. Peaceful non-engagement with other citizens has replaced civil war. Those who still endorse the logic of Aquinas and Calvin, however, are not restrained by the uncertainty of their convictions. For them, the Kalashnikov is the modern equivalent of burning at the stake. Technology changes; poor philosophy survives in the closed minds of religious fundamentalists. Featured image credit: Procession de la Ligue 1590 Carnavalet. Public domain via Wikimedia Commons. Desmond M. Clarke is Emeritus Professor of Philosophy at the National University of Ireland and a member of the Royal Irish Academy. 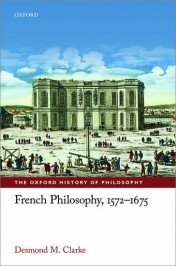 His recent publications with Oxford University Press include The Equality of the Sexes: Three Feminist Texts of the Seventeenth Century (OUP, 2013) and French Philosophy, 1572–1675 (OUP, 2016). His translation of Voltaire’ Treatise on Toleration will be published by Penguin (2016).